Which elements are rare earth element? 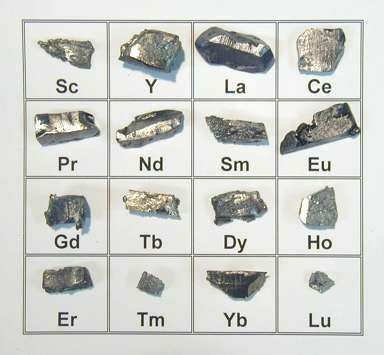 Rare earth is a periodic table of the chemical elements in the lanthanide and their associated and similar elements collectively, which comprises lanthanum ( La ), cerium ( Ce ), praseodymium ( Pr ),neodymium ( Nd ),promethium ( Pm ), samarium( Sm ) , europium ( Eu ), gadolinium ( Gd ), terbium ( Tb ), dysprosium ( Dy ) , holmium ( Ho ) ,erbium ( Er ), thulium ( Tm ),ytterbium ( Yb ),lutetium ( Lu ), as well as with lanthanide 15 elements are closely related to the two elements of scandium ( Sc ) and yttrium ( Y ) a total of 17 kinds of elements, called rare earth elements ( Rare Earth ), rare earth ( RE ). Rare earth element is originally from Sweden made scarce mineral found in the " soil ", according to the custom of the time, called the insoluble substance, so rare. According to rare earth elements atomic layer structure and physical and chemical properties, and their mineral symbiosis and different ionic radius can have different properties, seventeen kinds of rare earth elements are usually divided into two groups. ( also called light rare earth cerium group ) include: lanthanum, cerium, praseodymium, neodymium, samarium, europium, gadolinium, pm. Heavy rare earth ( also known as Y group ) include: terbium, dysprosium, holmium erbium, thulium, ytterbium, lutetium, scandium, yttrium. Said cerium group or yttrium group, because the mineral is obtained by separation of rare earth mixture, the two content more.